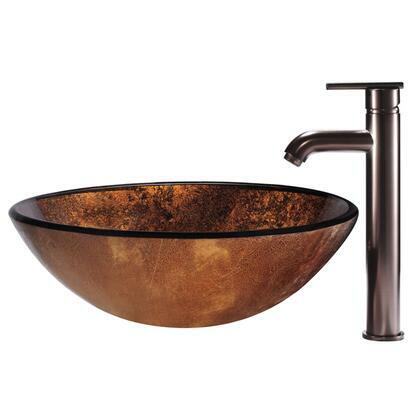 The VG07505 glass vessel bowl features the perfectly combined colors of brown and orange. I bought sinks from 2 different companies (Vigo and Kraus) to do different baths. Both were were stunning and looked very "rich" when installed. The faucet is heavy and of good quality. My only complaint is the pop up drain from Vigo is inferior in the quality of the hardware when compared to the Kraus. The soft white washer provided by Vigo was much smaller in diameter than the one supplied by Kraus, which lead to trouble with installation. My countertop installer drilled the standard 2" hole for the drain (Vigo recommends 1 3/4"), so the washer did not seal the drain hole. I had to special order a larger washer to fix the problem, which made that sink unusable until it arrived. So, providing a slightly wider washer would be a suggestion to make installation a breeze (since I am told that a 2" hole is the industry standard). Customer service was easy to deal with and did offer to send a new pop-up drain to see if that would fix the problem, so I was pleased that they stand behind their products. I still have yet to have the sink installed. It looks nice and I was happy that the supply lines faucet and drain all came with it. The faucet being for a vessel sink is important to be the correct height. 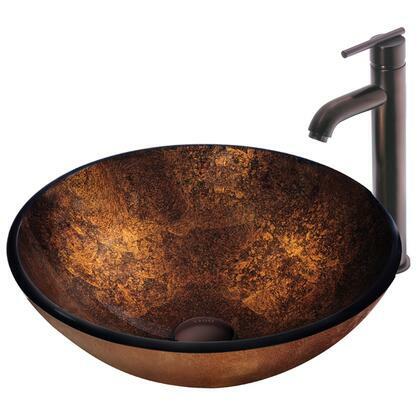 I purchased 2 of these Russet Glass Vessel Sinks and Faucets. They are really beautiful, well made, and functional. I bought this and was pleasantly surprised to see how pretty it was. pic does not show true color. Have not used it, just installed. Very simple, looks great. Only issue was that the supply lines were too short and Lowes does not sell a 24" line with 3/8 comp on both ends. Only had sinks for a few days now. One was leaking from valve. A simple tightening fixed the problem. So far very pleased. You can't get better packaging. Everything was in pristine condition.